I received some ‘Happy Mail’ in the post last week from Your Next Stamp just in time to use some of it for the new YNS card sketch challenge #18. I used Memento Tuxedo Black ink to stamp the image and coloured it with Spectrum Noir Markers in bright, summer colours. I used a clear Wink of Stella pen and Rangers Glossy Accents to embellish the eyes and the spots on his back and because I love bling, I added some small rhinestones to make the card sparkle!! For the sentiment I chose ‘Hey!…pick me!’ and added some motion lines because it looked like he was jumping up and down with excitement! I love that image too and I love how you coloured him. Great work with the sketch. The bright vibrant colours are so fun and perfect for the Happy Dance stamp.Thanks for sharing and playing along with our sketch challenge at Your Next Stamp. 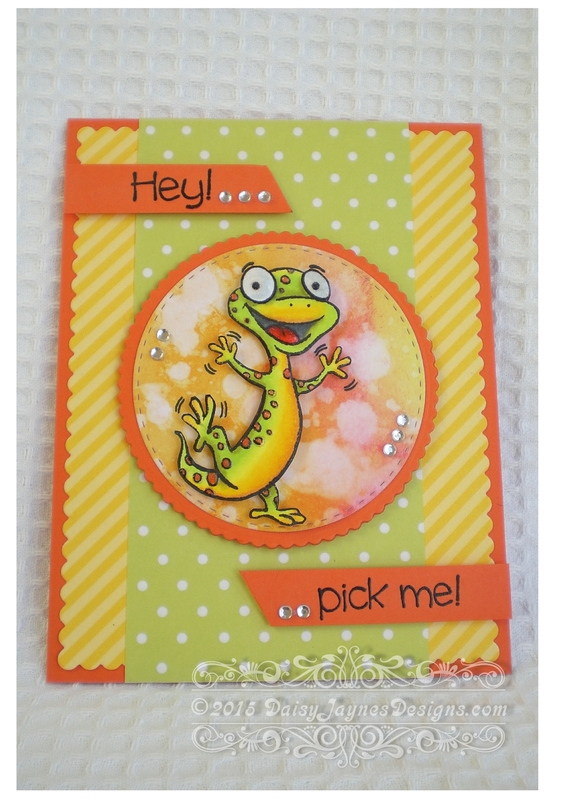 Definitely a happy card with the fresh color combo and smiling critter! Great take on the sketch, I like the way you offset the sentiment. Thanks for playing along with YNS challenge #18! Beautifully colored card! You did a fantastic job with the sketch. So glad you were able to join us at YNS. Super CUTE! Fabulous coloring too! Thank you for playing along with our YNS challenge! lol.. I love that sentiment so cute!! This came out great love all your colors too. Thanks for joining us at YNS!